My daughter is making a quilt…… I am so proud ! I am so proud… she is making a quilt! IF you knew how hard I tried to teach her to sew when she was a little girl…. NO INTEREST … fought it tooth and nail. 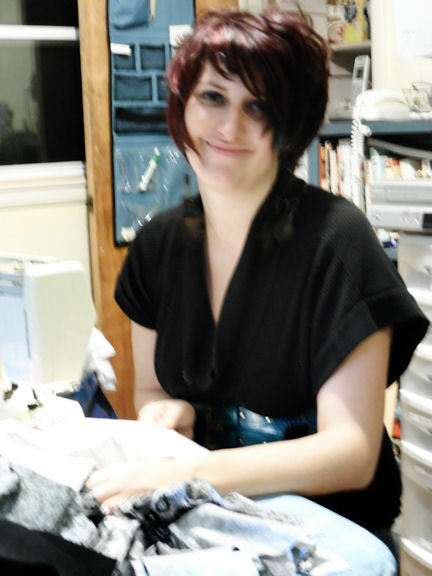 She did learn how to sew on a button and work a machine but until recently nadda ….. Then one day she raided my stash ( I kept my mouth shut. ) and started a gift for a friend. Her own design, her own way….. but she is sewing…. Jumping for joy here. BOREDOM gets me into trouble every time….. It all started with boredom. So I started to sort and cleanup my stash. Came across a big box of fat quarters I had purchased when I started quilting in 2005. It was a rainbow assortment of all kind of fabrics I bought when I did not know what I was doing. Perfectly good QUILT SHOP QUALITY FABRIC, but not to my taste or style any more….. What to do, what to do. I decided on scrappy quilts. I would cut up the fabric into useable sizes ala BONNIE HUNTER and / or SCRAP THERAPY. But that did not sound like fun. Another idea! I have a bolt of Kona White! 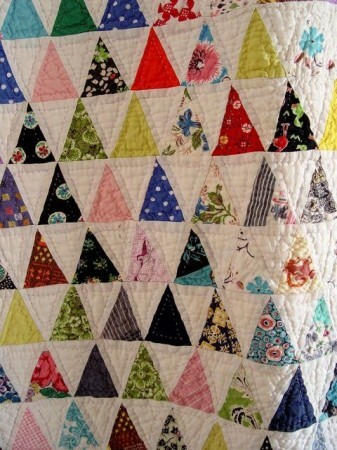 I have just been on Pinterest and saw picture of a beautiful antique thousand pyramid quilt. I have always wanted to make one of those kind of…… I have my own idea about what is will look like. I wanted more white space in the quilt. Plus I want to find a way to make the pyramids float more across the quilt. PYRAMID QUILT TUTORIAL…. but this is NOT THE WAY I AM MAKING MY QUILT. ONLY fabric currently in my stash can be used. I will cut 8-1/2 inch strip off my fat quarters and sew 2-1/2 inch on each side, then cut off the triangles from the strip set. I should be able to cut three triangles for each strip set. ( Pictures to be posted someday, maybe ….. Who knows maybe with a pattern.) 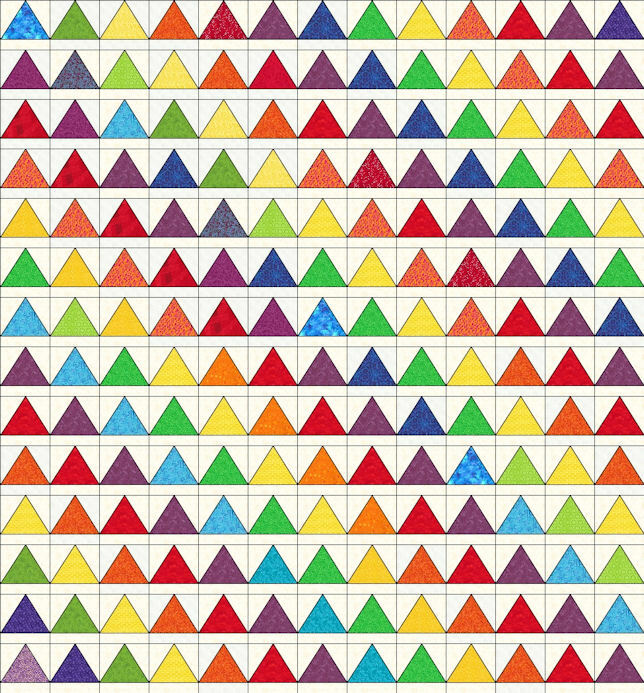 The triangles would then be put aside and sorted into colors. RED, ORANGE, YELLOW, GREEN, BLUE, PURPLE …. based on a rainbow and a box of my favorite crayons. I will devise my own method to make the blocks and hopefully have them float within the field of white. All cut away scraps will be put into a scrap bag for MILE A MINUTE / CRUMB / GIBLET & GRAVY blocks before I can sew on my pyramid blocks. HOPEFULLY, I can tame the scrap monster that lives in my house. I use to make these blocks for charity donations but I have been very lax about that recently. But I did a number of these blocks on BLACK FRIDAY SEW IN day and they are in the mail. I am in the process of taking pictures about making a MILE A MINUTE / CRUMB / GIBLET & GRAVY block using foundation for pasting so stay tuned…. . THE call is out for QUILT BLOCK DONATIONS NEED FOR SANDY VICTIMS AT QUILT GALLERY… I have sent out a set of 12 blocks for their quilt and am working on another set. I send enough blocks to make a queen size quilt. My blocks look a little different but they are framed in black and enough for an entire quilt. I have even sent an assembled quilt ( UFO) top to their organization. Here is the link. ….. DONATION BLOCKS FOR SANDY VICTIMS AT QUILT GALLERY….. CAN YOU HELP ???? Modern QUILT GUILD call for donation quilts…. Information on this web page. IF you GOOGLE, QUILTS for Sandy Victims information for groups / organizations will pop up. Call for Quilts and Quilt Blocks ….. Quilting Gallery and Modern Quilt Guild has put a call out to quilters….. THE call is out for QUILT BLOCK DONATIONS NEED FOR SANDY VICTIMS AT QUILT GALLERY… I have sent out a set of 12 blocks for their quilt and am working on another set. I send enough blocks to make a queen size quilt. My blocks look a little different but they are framed in black and enough for an entire quilt. I have even sent an assembled quilt ( UFO) top to one of the organization collecting quilt tops to long arm. IF you google QUILTS for Sandy Victims information for groups / organizations will pop up. I am hoping everyone is having a HAPPY THANKSGIVING. I am lounging around watching my grandson play and taking advantage of the fact that I do not have to work today. I just finished going through the mail and I came across a couple of packages that had been stashed in the wrong place. The WRONG PLACE being somewhere hidden so that I did not know they had arrived. 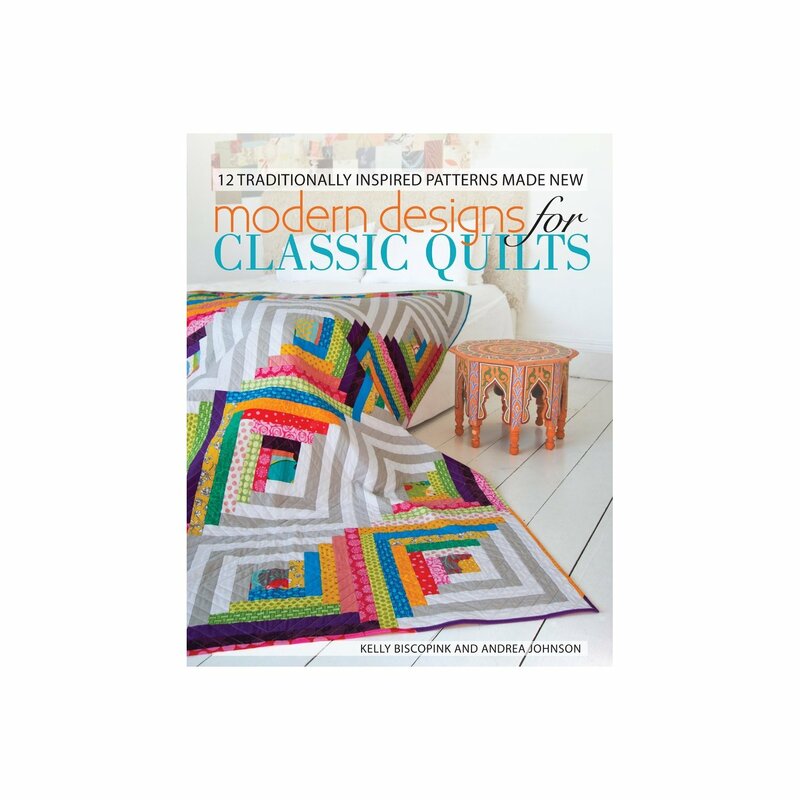 I ordered the book, MODERN DESIGNS for CLASSIC QUILTS. after seeing it on the internet. I picked it up planning to just surf through it today but end up spending a lot of time reading through it. THE FIRST CHAPTER is a collection of brief essays on what the author thinks MODERN vs TRADITIONAL is, their theories on stash building, the use of colors and fabrics. I can say I agree with some of their opinions and others my thoughts are, “WHAT ARE THEY THINKING?” But I love to disagree, just to disagree. The SECOND CHAPTER lists tools that are helpful in the making of quilts, things most quilters have in their basic sewing kit. They then review many of the basic techniques used in making the quilts in the book. I am going to re-read this section as there were several points I disagree with and it could just be my reading of the directions and not the directions themselves; but I recommend reading several books and learning many ways of doing the same thing whenever possible. Being open to learning different techniques and methods is good for your brain. Did you know quilting is good for your brain, so says recent research in Alzheimer and dementia. 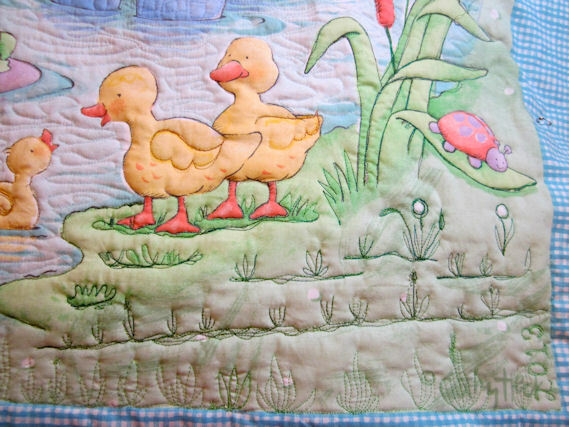 Quilting ( learning anything new and different) is good for brain health. BACK TO THE BOOK …… What I enjoyed most with the book was when they took a traditional block and put it into a modern design. 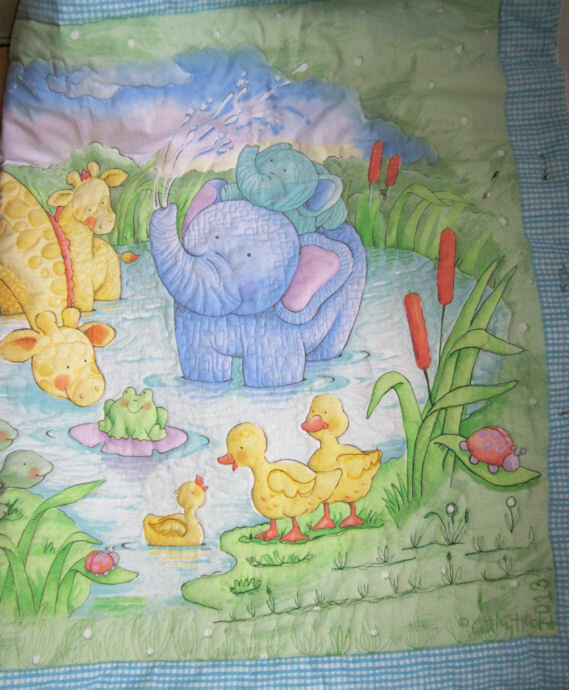 The DRESDEN FILES, IN THE CLOUDS (flying geese,) MESHUGANA (known to me as Crazy Block, giblets and gravy,) PANTONE POCKET CHANGE ( Chinese Coins) LES ELEFANTS et HIPPOS ( aka Disappearing 4 Patch) and one of my favorite quilts URBAN CABIN ( updated LOG CABIN.) There are 12 projects in the book made from traditional patterns in interesting modern designs. I do enjoy the majority of the book, I love the different interpretation of classic traditional blocks as used by the modern quilters. I find I love the negative space and how it is being used in the modern quilts. I am finding I love quilts with lot of negative space… in part because I think I am getting lazier and want to make more quilts with less work ( blocks) I also find I like the open spaces, especially with interesting FREE MOTION QUILTING. I am not always fond of the color choices but that hold true of any quilt style. I have very defined color sensibilities, as I have said before I do not LIKE complementary color schemes very often. I also found lately I am bored by orange, cyan color combination, I think it is rather garish. But it always depend upon the setting and the use of the colors in the quilt. GREY is the new brown. Where older traditional quilters used cream and brown profusely I now see grey being used as the neutral. I think this is in part influence by what is available to match HOME DECOR. Daughters and young quilters decorate their home in different styles and colors when compared to their mothers and grandmothers, so that is to be expected. I have always liked grey but found it hard to use in a quilt or in decor. I have only gone thru the book Modern Designs for Classic Quilts once but have “post-em-ed” several patterns I want to make in my own interpretation. ( I never make a quilt according to the pattern, in part because I do not know how to follow a pattern. I usually go off on my own regardless of who writes the pattern.) I think this is one reason I am attracted to THE MODERN QUILT MOVEMENT. They are not married to the rules of quilting as much as making quilts that they love and enjoy. I do recommend this book, if you like Modern Quilts and are a new quilter, as I found many patterns I liked and can dream of making. I liked the use of negative space in the patterns and how they have their own style. For the most part the directions were well writen and a good jumping off point for new quilters. I do recommend reading and learning quilt techniques from more quilt books and have recommended several books in the past and will add links to this blog for several of my favorite quilt HOW to books. Any projects I make will of course I will be making them from my stash … so they probably won’t be very modern when I get done with them…. BUT it is the thought that counts…. IT has been really slow going with the FMQ I have only been able to work on it an additional hour or two. I hope to get time to work on it tomorrow. Right now I am editing another podcast. I have finished the CRAFTSY class BEYOND BASIC FREE MOTION QUILTING with Ann Petersen. I learned a lot from Ann’s class and applied what I learned to this project. Close up of MACHINE tacking method. IN these close up pictures you can see a MACHINE TACKING METHOD. Quilters have hand tacked quilt tops for ages. I did similar technique, but using machine. The batting says that the quilting can be 10 inches apart. I did some thread painting or free style embroidery which tacked the quilt top. 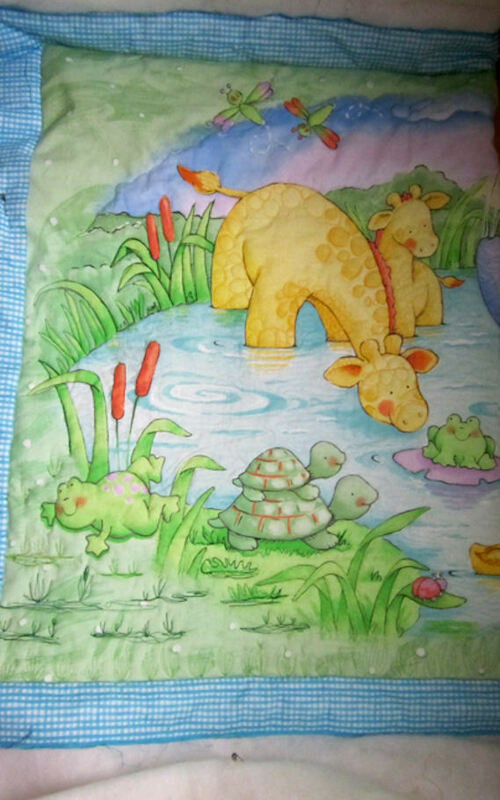 I think it added details to the top but maintained the lightness and puffiness I wanted in the baby quilt. I opted not to do continuous line quilting as I felt the quilt was getting over quilted. 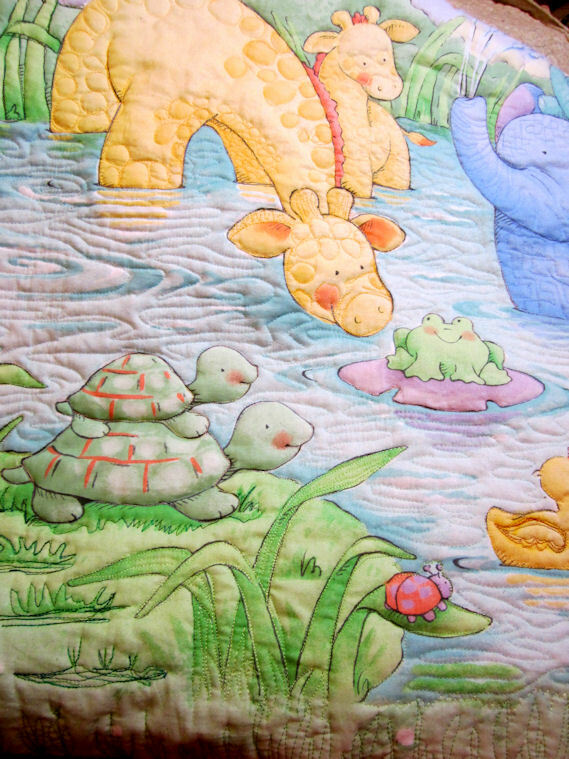 I feel the free style tacking added to the design of the quilt panel by adding cute details. I still have half of the quilt to FMQ, and then add borders to get it to the needed size….. WHAT DO YOU THINK? Captain America went trick or treating in the rain, sleet and snow… nothing will keep him away from his CANDY. 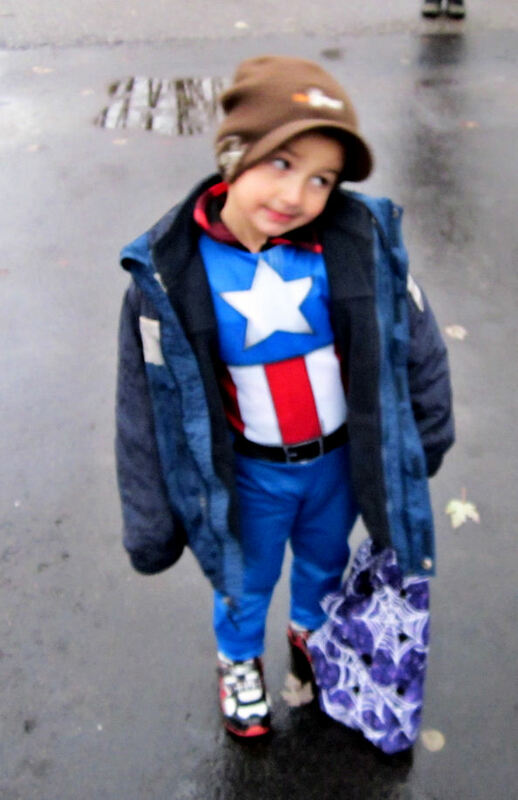 Captain AMERICA came to trick or treat… but it was so cold he had to have winter coats and hats on….. He changed his mind endlessly all day Halloween cause he could not make up his mind which SUPER HERO he wanted to be… Iron man, Superman, Bat Man ( never Robin) or Flash. He put on all the costumes and kept changing all day long. My hubby took the pictures as he walked them around the neighborhood this year. I stayed home where it was nice and warm.